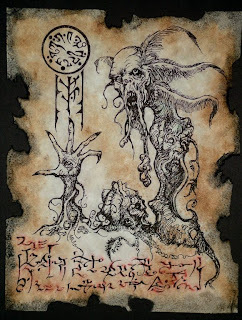 "And there were many other weird plants, diverse as the seven hells, and having no common characteristics other than the scions which Dwerulas had grafted upon them here and there through his unnatural and necromantic art. These scions were the various parts and members of human beings. Consumately, and with never faillng success, the magician had joined them to the half-vegetable, half-animate stocks on which they lived and grew thereafter, drawing an ichor-like sap. "